Scales for weighing individual gooseberries, circa 1870. Cliffe Castle Museum. I love drawing in museums. 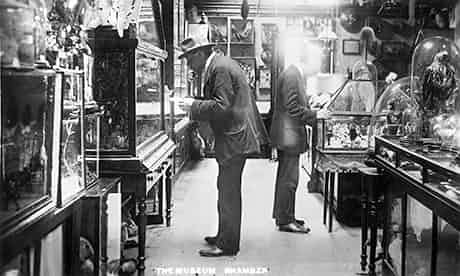 I think this fascination with strange objects goes right back to my childhood, because I remember at the age of about 7 or 8 I created a tiny museum of my own in the Wendy House my father had built for us at the bottom of the garden. It had an odd assortment of things on display, each carefully labelled – an elephant’s tooth paper-weight, a stone age scraping tool made of flint (I found this on the North Downs near our home) several disassembled owl-pellets (collected and examined by my sister and me) and a small clay hippopotamus with a gaping mouth displaying my own teeth, thoughtfully returned by the tooth-fairy. 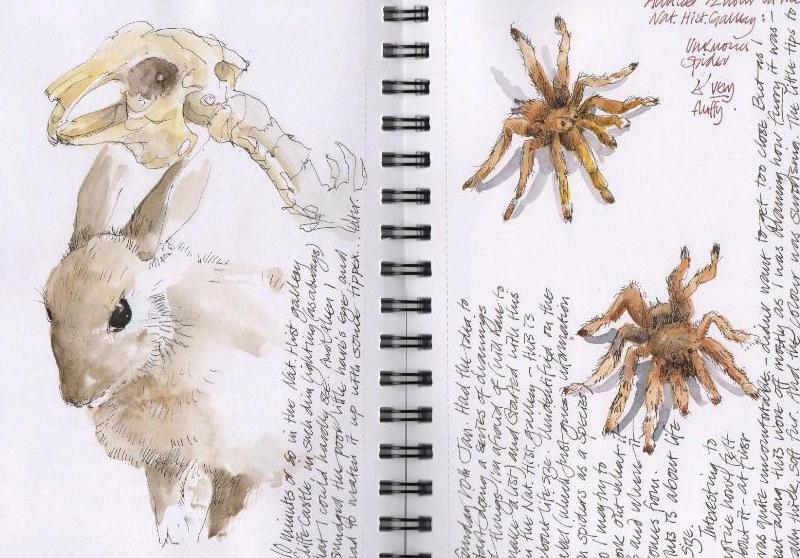 There was an obvious bias towards natural history, but also a preoccupation with oddities – probably influenced by our occasional visits to Potter’s Museum in Bramber, on the South Downs in Sussex. It was an extraordinary place, very unlike the museum in our county town of Maidstone (where my flint tool was authenticated) or the Natural History Museum in London, which I also came to love. Potter’s Museum was dark and crowded to overflowing with indescribably strange things many of which were weird and slightly grisly. We loved it. 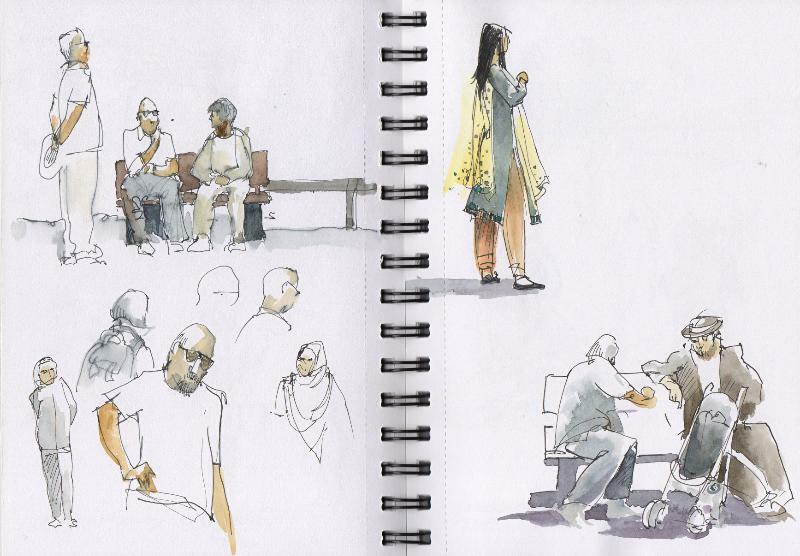 It’s that time of year again – the 1 Week 100 People sketching challenge. 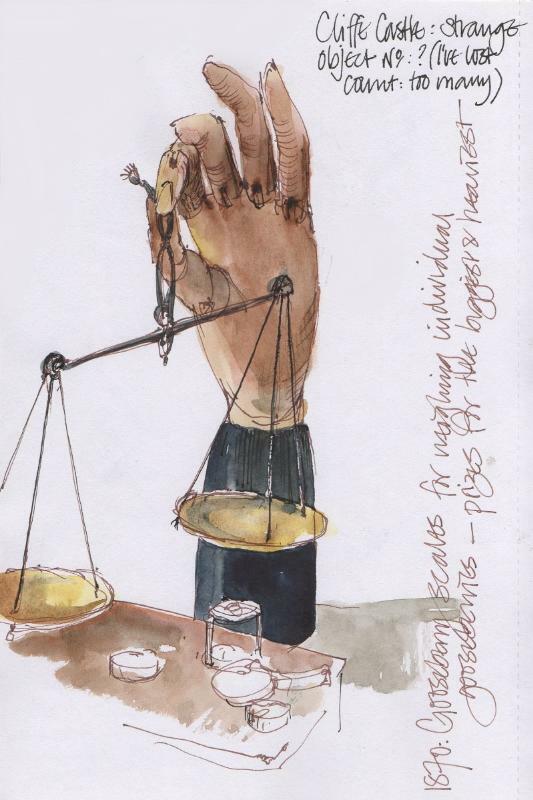 I’m not going to stress myself by trying too hard to hit the target of 100 people, although you never know – but I haven’t been sketching fast enough or for long enough. But for me that’s not really the point – I’m getting a lot of practice – and I’m using the challenge to sketch in different ways. Some more successful than others – but all fun. 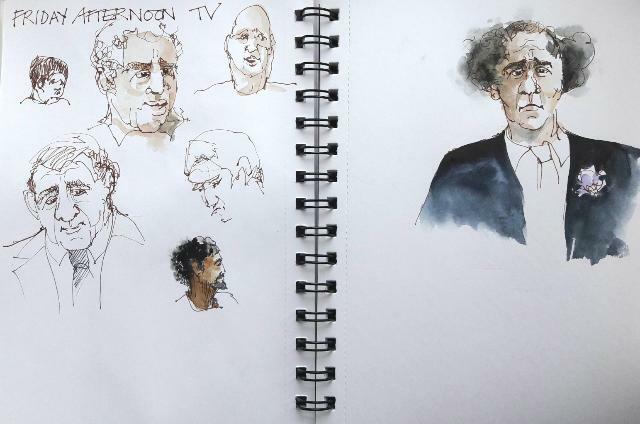 I sketch a lot from the TV – anything I happen to be watching, news broadcasts, dramas, documentaries, films. People moving are a lot more interesting to draw than people caught in a still photo, and there’s such a huge variety of faces and expressions. But then there’s always the challenge of doing a bit of a portrait study from a photo, and I realised I’m not even restricted to drawing living people – so here’s Robert Browning, from an incredible portrait photograph by Julia Margaret Cameron. The drawing doesn’t do the photograph justice – he’s actually far more charismatic and doesn’t look half as pale and worried. I’d said I would draw from images of the students who survived the Florida school shooting and who have been campaigning for gun control and I have a number of photos that I intended to sketch, but today when I looked at them I felt very reluctant to use them in this way. I may come back to them but it doesn’t feel right at the moment. Instead I drew from a photo of two young armed women police officers who were patrolling the area around the school just after the shooting. Impossible to record everything I felt as I sketched this; I haven’t caught the complexity of emotion on their faces but there was so much there – anxiety, determination, shock, and a sort of stoicism and sense of duty. I couldn’t help but be struck by the amount of arms and weaponry they carry which seems overwhelming, and the fact that they both look so young. I felt it shows a lot, too, about the way an incident like this traumatises the whole community and what a burden of responsibility is carried by the police and security services, and also all the teachers and staff at schools across America – who incidentally do not want to be asked to carry guns. And when I can I sketch from life! The task of nail-cutting, requiring concentration and a lot of movement in the hands, which explains the confused blurriness of fingers. The week goes on – I’ll post more towards the end of the challenge. And a technical note: I’d recently ordered some De Atramentis Document Ink Thinner from The Writing Desk and it arrived just in time for me to try it out this week. I love it! You can use it to dilute De Atramentis ink and I’ve mixed this lovely pale grey using blue + brown mixed with thinner. Great possibilities……. 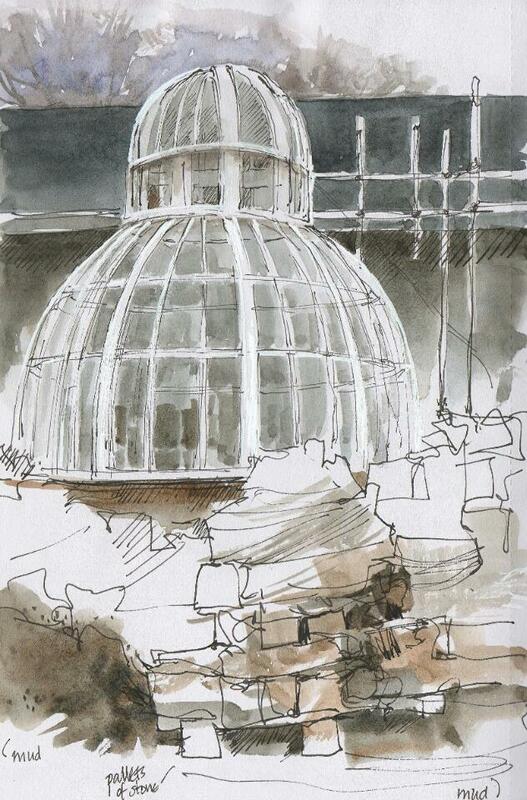 Ever thought you might like to join in and try sketching in the glasshouses and the park at Cliffe Castle? 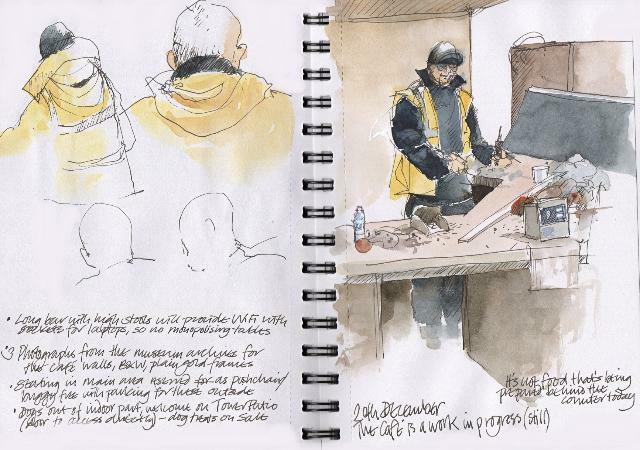 Louise Garrett and I are planning a series of Sketchwalks at Cliffe Castle. 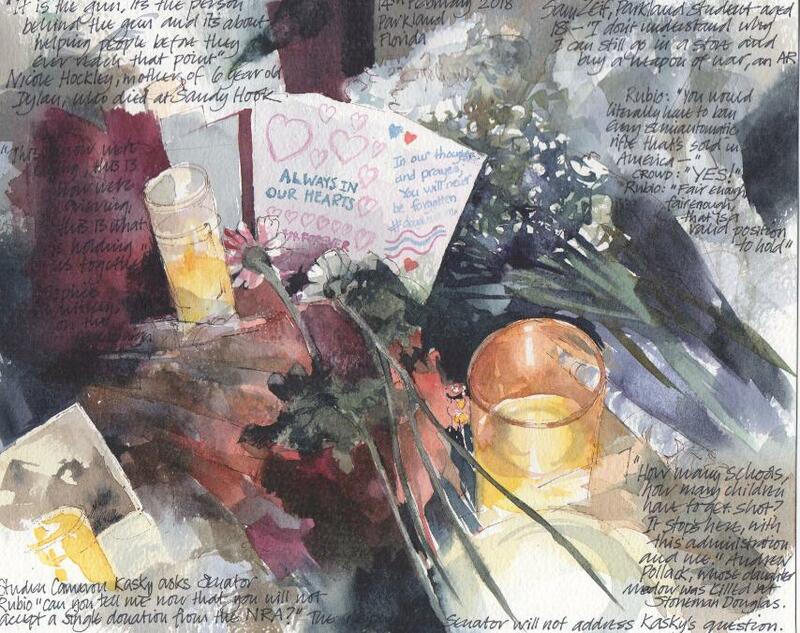 They’ll be a kind of cross between what Urban Sketchers call a sketchcrawl (a fairly informal get-together at a prearranged spot to meet, sketch and enjoy each others company) – and a guided workshop. 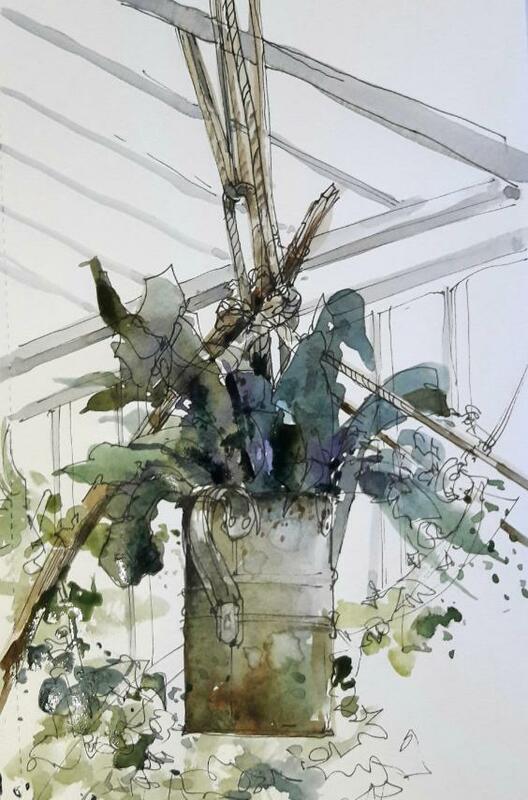 We’ll be welcoming Sketchers of all levels of ability and experience – even those who have never sketched before but who’d like to – and exploring sketching skills in the newly opened glasshouses and around the park. A bonus is that the café in the glasshouses is now open! The sessions will be led by Louise, and the first is on Wednesday February 28th, from 10.30 – 12.30. 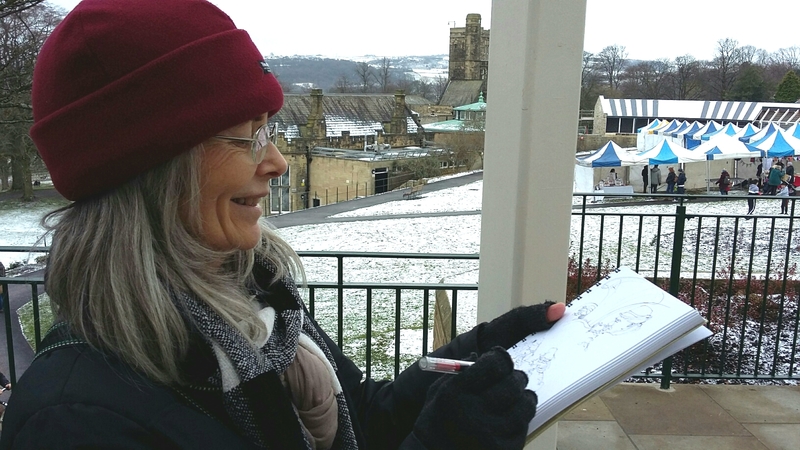 The Sketchwalks are being supported by the Parks Dept and Cliffe Castle Conservation Group and are being advertised locally to anyone interested in sketching. They’ll be in sets of 2, the first set Feb 28th and March 14th, and the second set May 16th and May 30th. Numbers have to be limited, due to the workshop format and space limitations – so if you’re interested, more information is on Facebook here – and if you’d like to reserve a place, email cliffe.castle.park@bradford.gov.uk – and you’ll get your place confirmed. 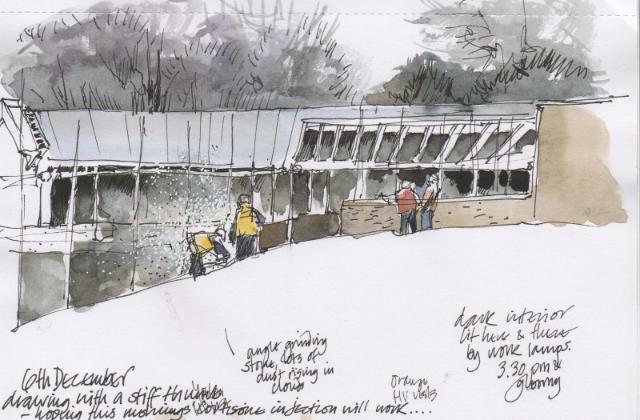 Throughout the whole restoration project at Cliffe Castle I was reluctant to draw the new glasshouses, at first because the site was mostly hidden behind security fences and was hard to see. 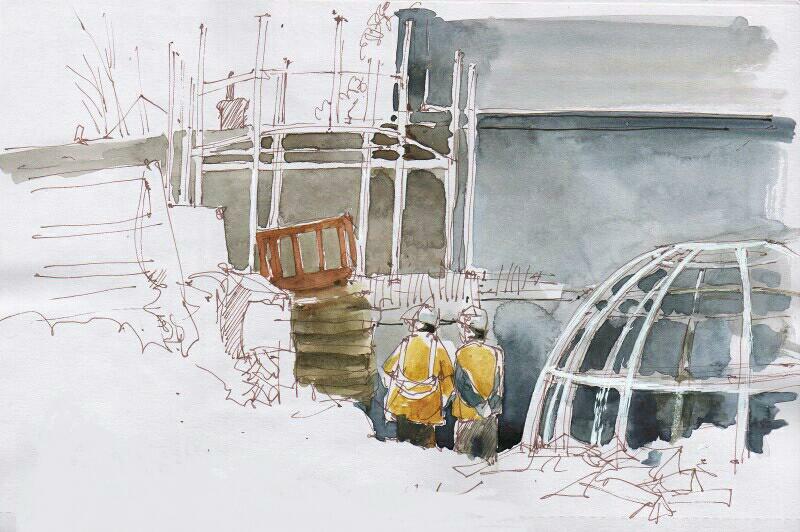 I sketched the dome when it first arrived on site and later when it was raised, by a huge crane, and carefully lowered onto the framework. 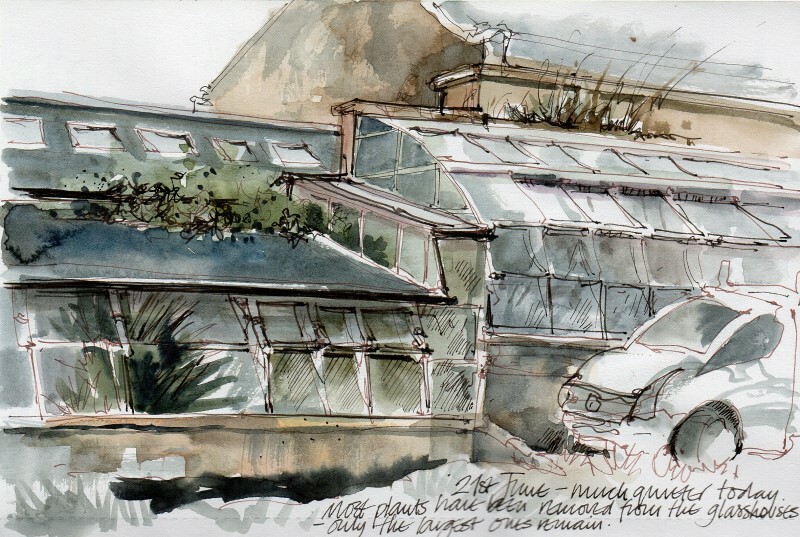 And earlier still, right back at the beginning when things were being demolished, I sketched the old glasshouses to capture them as they were before they disappeared. But for the last month or so the terrace has been complete (although we’re still waiting for the animal houses and aviaries to be finished) so I didn’t really have an excuse, other than the weather. I kept telling myself I really must have a go, but every time I looked at them I was alarmed by the technicalities – delicate white glass structures are hard to draw and the dome is full of complex elipses, (spot where I got that wrong) not to mention the perspective and the fact that whole thing is built on a hill. So in the end, especially as it’s still cold and often windy (today we’ve got intermittent storms of sleet) I took numerous careful photographs and worked from those. I don’t really enjoy doing this – it doesn’t give me the buzz that working directly outside on location does, and I never feel I’ve really connected with the place – but it does mean I could take my time working out how to get to grips with all that spindly white framework. Unfortunately it also made me work less spontaneously and fluidly and much more tightly than I normally do these days – but hey, these things happen. Now I know the structure better and next time I sketch it – from life, hopefully! – I’ll be more relaxed and look forward to drawing it in a completely different way. You’ve arrived at the blog-page of my website. The most recently published post is just below this one – simply scroll on down. To help make it easier to find posts on different subjects, this post will stay at the top of the blog page to point you where you might want to go. If you’re looking for a particular post or subject, you can always go to the Home page or the foot of any other page, and scroll to the bottom of the screen where you’ll find a Categories drop down menu, and also a Search button. 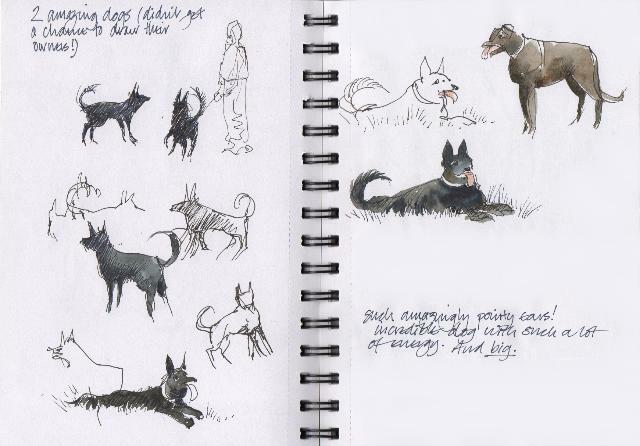 If what you want is simply to see the sketches from Drawing The Work on their own, rather than seeing them as part of the story in a blog post – I’ve put a selection of the sketches on the Drawings page. Those who recall Cliffe Castle from years ago will remember there were always animals of one kind or another, and birds. Stories from far back in living memory tell of peacocks that roamed about and occasionally got into other people’s gardens and even into the classrooms of Greenhead School (before the days of University Academy Keighley). Going even further back some people remember a parrot, and someone told me the other day there were pot-bellied pigs. When I first came to Keighley there were chickens in a pen below the old playground. 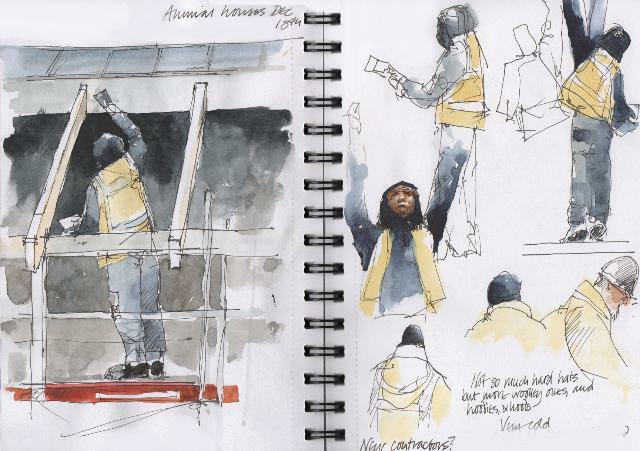 But the animals I remember best and loved the most were the guinea-pigs and the rabbits, and these buildings that I sketched earlier this month and which are still being finished will be their new home. I’ve been longing for them to return and it’ll be wonderful to have them back. (Birds will return to the aviaries, but which and when remains to be seen). At the same time, at the other end of the glasshouse terrace, the café is being fitted out – at the moment still at the carpentry stage, counters, shelving, storage units – and this is tremendously exciting because we’ve all been waiting so long now since the old café closed. This new one will be so much better in so many ways. Wonderful views, much more comfortable, good hot cups of tea and coffee (and much more besides) – and dog-friendly, as the covered patio at the Tower House end of the terrace has an adjoining door, so that dogs and their owners can sit in comfort together, sheltered but apart from the main indoor café. It’s cold in the park these days (today it snowed) and not easy to sketch outside. My fingers get stiff, and recently I’d been struggling with a painful finger and thumb on my drawing hand that wouldn’t straighten, which is now thankfully much better due to a cortisone injection. For a while I was sketching in a whole new strange and wonky way, but things are getting back to normal. Until the café opens the glasshouses are still not open to the public either as this requires an on-site presence, so it’s even more eagerly awaited, and for now all we can do is to peer through the windows, admire the cacti and watch the carpenters at work. Me, I’m looking forward to somewhere warm to sketch from – that, and a good hot cup of tea. At last the long awaited day for the re-opening of the restored park at Cliffe Castle finally arrived, last Sunday, and with fanfares and trumpets (well, a brass band) we celebrated in style. The glasshouses have been decorated with birds from the 12 days of Christmas made by children from early-years age groups in local schools. 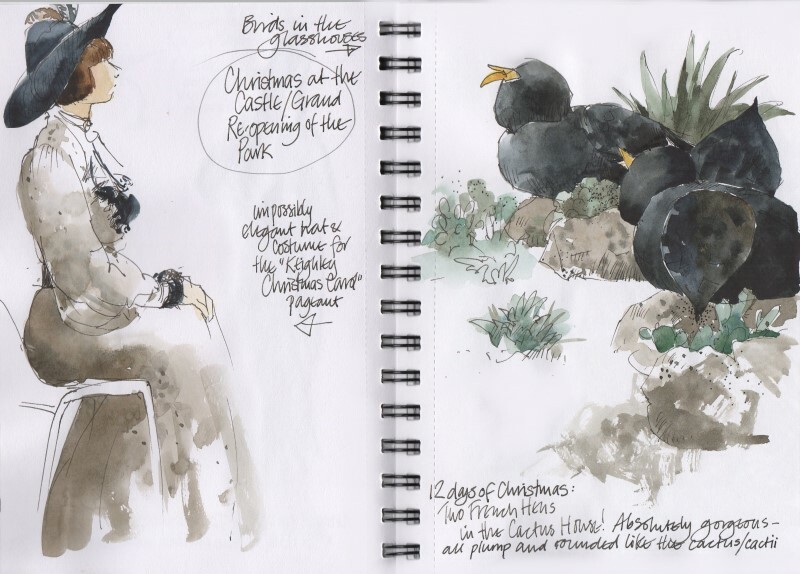 I’d been dying to sketch them because they’re just gorgeous – and they look wonderful nesting among the succulents and ferns and flying overhead. 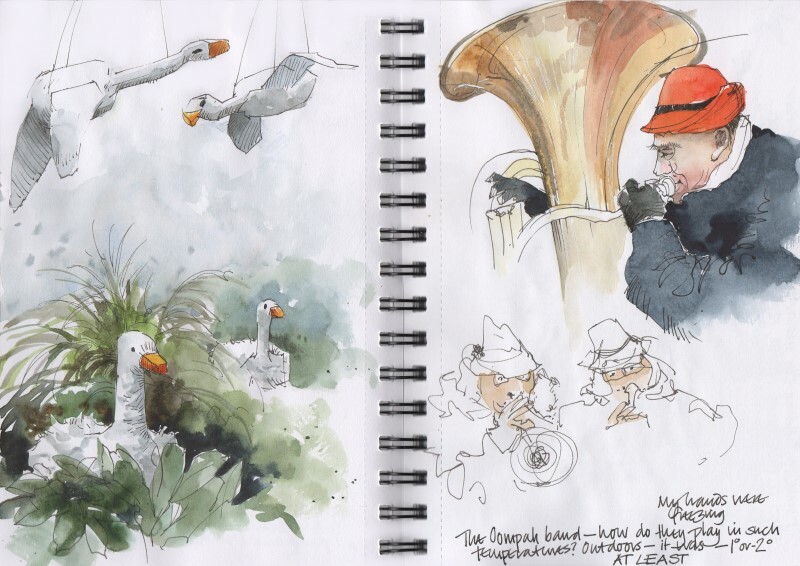 Outside the Oompah band were playing with gusto in sub-zero temperatures; my fingers were almost too stiff to draw. Along with hundreds of visitors, against a background of snow we heard speeches from dignataries, watched a costumed pageant of Cliffe Castle past present and future, listened to a children’s Christmas choir, and cheered when the Dome House was declared open as a golden ribbon held aloft by two stilt-walking fairies was ceremoniously cut. These stilt-walkers never stopped smiling and unbelievably showed no sign of feeling cold, even when waving their wands and standing around holding the ribbon. There was such a crowd I couldn’t get a good view for more than a few seconds at a time so I took photos – but they turned out to be extremely hard to draw. It’s very disconcerting looking up at someone who’s about 10 feet tall, and my brain must have stubbornly refused to accept this and wouldn’t let me get the foreshortening right, so they don’t look anywhere near as lofty as they should. 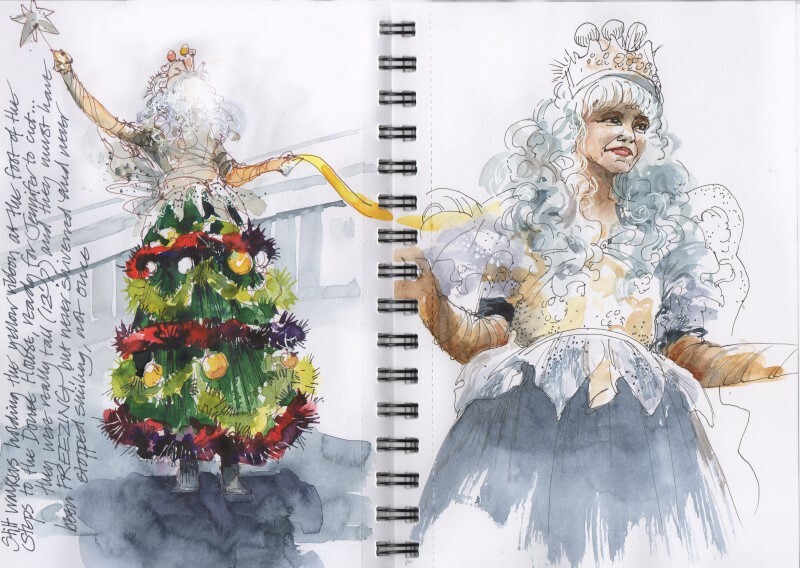 Their costumes were so beautiful I had to do a bit of sketching from my photographs later but still got them out of proportion. And don’t ask what happened to the face of the fairy on the left….. The birds in the glasshouses include two gloriously chubby French Hens with outstretched wings that look extremely happy among the cacti – they were attracting admiring looks and smiles from everyone who passed them. They’re just irresistible. The immaculate Victorian costume and the stunning hat were from the pageant, thankfully indoors in the warmth of the Castle. 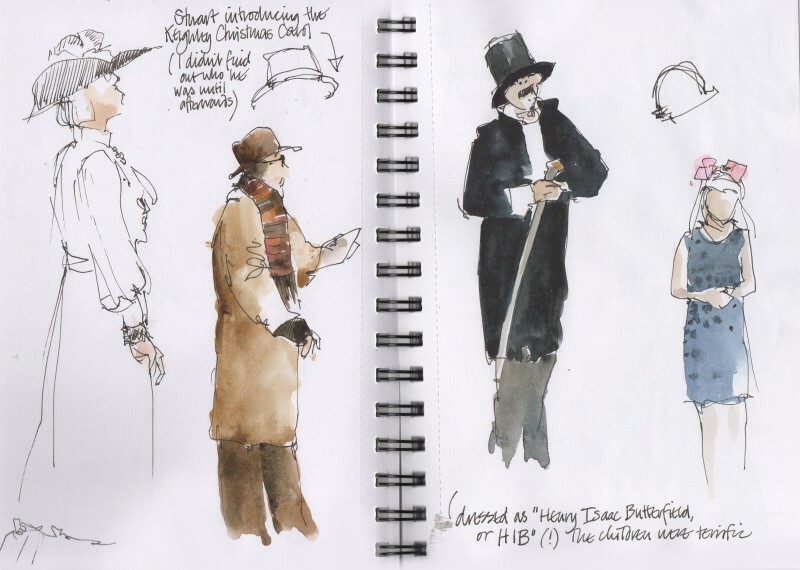 The Keighley Christmas Carol was an ingenious way to present the past, the present and the future of Cliffe Castle – the children did a wonderful job of portraying the Butterfields. This is Henry Isaac Butterfield himself – or ‘HIB’. I couldn’t sketch fast enough to catch all the scenes…. So now the park is officially open again (even though there are still things to be finalised). The half-finished café opened for the day with a sign on the door saying ‘Opening Soon’ and was overwhelmed with customers. There was a real sense of catching a moment in history here; the children who played such a big part in the celebrations will be the ones who use the park for generations to come and who’ll look back and remember this day as the start of a new era at Cliffe Castle, and I will never forget it. Sketching the Oompah band on the glasshouse patio under the Tower House with fingers so cold I could hardly hold the pen, I felt suddenly and overwhelmingly happy to be part of this space suddenly alive and filled with people for the first time. I found myself grinning like the Christmas tree fairies.